Enjoy 2 hours Bali Spa massage and It consist of herbs and spices that we wrapped tightly in muslin or cotton and then push in hot water or steam my be placed on various part of the body to relief shore muscles, stimulate circulation and refresh the skin. With a professional and experience Spa theraphists in your treatment will give you and excellent therapy care for refresh your mind and body. bali spa is very good for you to make your blod circle relaxing and will make you fresh. 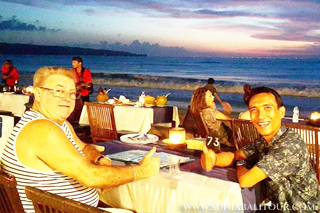 Jimbaran Beach is just small fishing village which people work as a sailor and now is getting famous for the centre of Seafood Dinner with delicious food and fresh from the sailor around the village. Is a beautiful beach located in the Jimbaran Village at southern part of Bali Islands with white sand unfolding along the coastal. There are plenty of cafes offer delicious of seafood dinner with breathtaking view of Indian Ocean . Seafood Dinner served right on the beach with beautiful table set up apposite to the ocean.